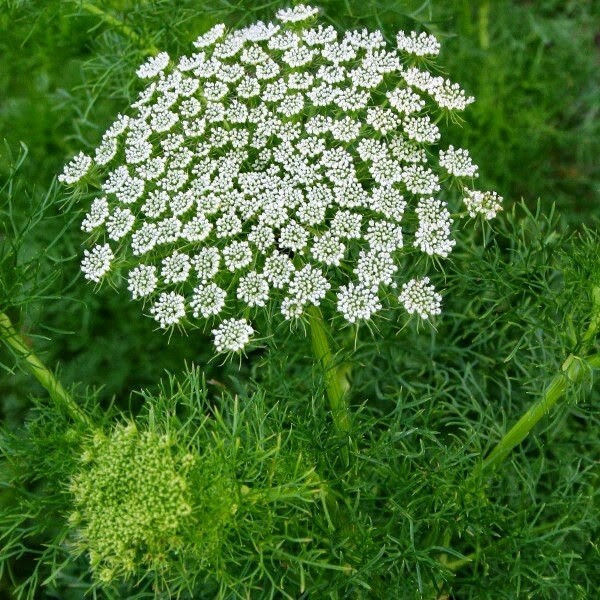 Ammi visnaga is a species of flowering plant in the carrot family known by many common names, including toothpick-plant, toothpickweed, bisnaga, and khella. Also known as Bishop's weed. It is native to Europe, Asia, and North Africa, but it can be found throughout the world as an introduced species. This is an annual or biennial herb growing from a taproot erect to a maximum height near 80 centimeters. Leaves are up to 20 centimeters long and generally oval to triangular in shape but dissected into many small linear to lance-shaped segments. The inflorescence is a compound umbel of white flowers similar to those of other Apiaceae species. The fruit is a compressed oval-shaped body less than 3 millimeters long. Cautions: Avoid during Pregnancy. For external use only, this is considered toxic if taken internally. Dilute before use; may cause skin irritation in some individuals so a skin test is recommended prior to use; Phototoxic - avoid sun exposure if applied topically. Avoid contact with eyes. Ammi Visnaga / SD- W / Morocco / Seed Main Constituents: khellin visnagin Plant Part: Seeds Farming Practice: Wild-Crafted Origin: Morocco Processing Method: Steam Distilled Ammi visnaga is a species of flowering plant in the carrot family known by many common names, including toothpick-plant, toothpickweed, bisnaga, and khella. Also known as Bishop's weed. It is native to Europe, Asia, and North Africa, but it can be found throughout the world as an introduced species. This is an annual or biennial herb growing from a taproot erect to a maximum height near 80 centimeters. Leaves are up to 20 centimeters long and generally oval to triangular in shape but dissected into many small linear to lance-shaped segments. The inflorescence is a compound umbel of white flowers similar to those of other Apiaceae species. The fruit is a compressed oval-shaped body less than 3 millimeters long. Cautions: Avoid during Pregnancy. For external use only, this is considered toxic if taken internally. Dilute before use; may cause skin irritation in some individuals so a skin test is recommended prior to use; Phototoxic - avoid sun exposure if applied topically. Avoid contact with eyes.